A few years ago, we took the leap from 5ks to 10ks with the LL Bean 10K. The deal breaker for us to make the leap was the promise of free shoes. 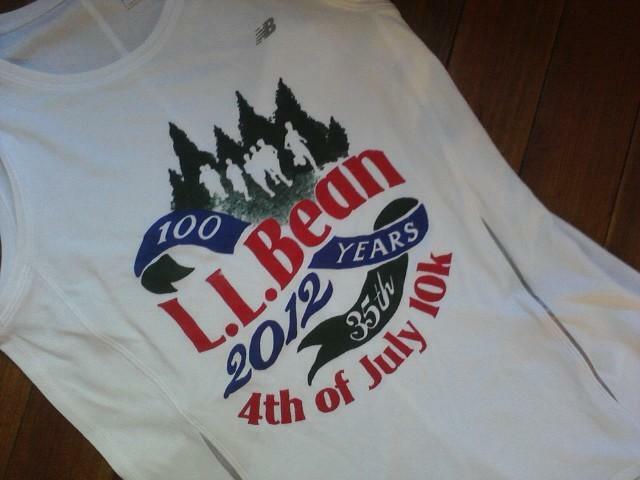 For a few years, LL Bean offered a pair of New Balance running shoes if you were one first 400 lucky ones to register. This year the race director changed the shoe policy and changed it to a lottery system if you signed up by a certain date. 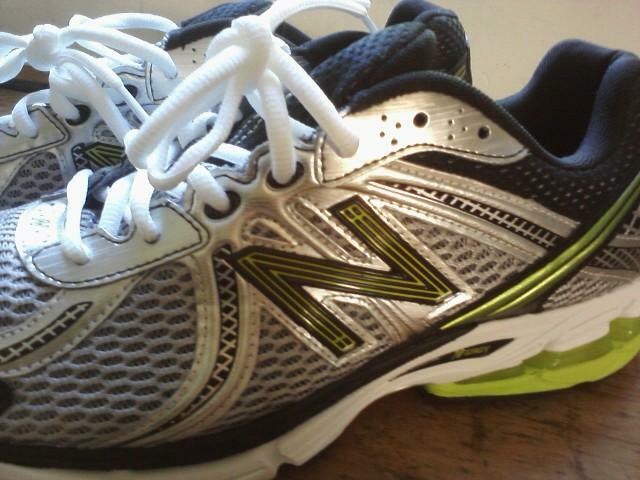 To be honest, I’ve never been a huge fan of the New Balance model we given, but Ward always liked his. It seems like the LL Bean gods were listening, because I did not win the shoe lottery, but Ward did. Lucky guy! If you ever make it to the area, you should definitely try out this race. The course is challenging yet it takes you through some beautiful areas of Freeport. Crowd support is also a bonus here. I love seeing the families sitting at the end of their driveways, sipping away at their coffee (or mimosa), cheering on the runners. I thoroughly enjoy the person always has their hose spraying over the road to offer the runners a quick cool off. The volunteers are incredible as well. Constantly offering support and cheering on the runners the entire way. In addition to the shoes, the other bonus is a pretty nice shirt. It’s a New Balance tech t-shirt for the guys and a New Balance tech tank for the women. This year, the girls and I decided to make this a sparkly kind of race and we ventured out to make our own sparkle skirts. Carrie at Maine Mom on the Run was the super sweet one to pick up the fabric, elastic, and thread. She wanted to go with a red sparkle skirt and Stacy and I wanted blue. Last Saturday, I borrowed Jill’s sewing machine (since both of my ancient hand-me-down sewing machines were not cooperating with me) and challenged myself with the making of 5 blue sparkle skirts: one for myself, Stacy, Jess, Jill (even though she ditched us and went to Florida with her mom), and our friend Darcy. 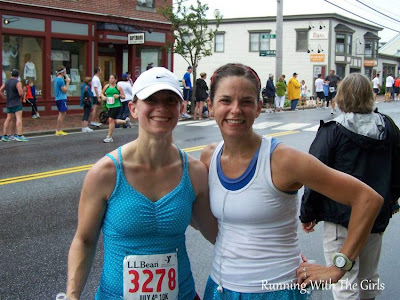 Now, I just need to mention that Darcy just ran her 1st 5k ever a few weeks back and then took on her 1st 10k with the LL Bean 10k. Isn’t that impressive? I went into this race just hoping for my best. 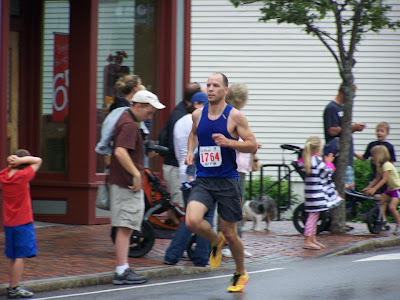 In my opinion, this course if more challenging than the Beach to Beacon 10K course (which is where I scored my 10K PR last summer), so I wasn’t really aiming for an overall 10K pr, I was just looking to improve upon my course time. My time last year was 50:29. I knew I had it in me to do well, I just needed to keep my mind focused on the hills and the mind game that they play on me. The first half of the race is mostly downhill and the second half is uphill. 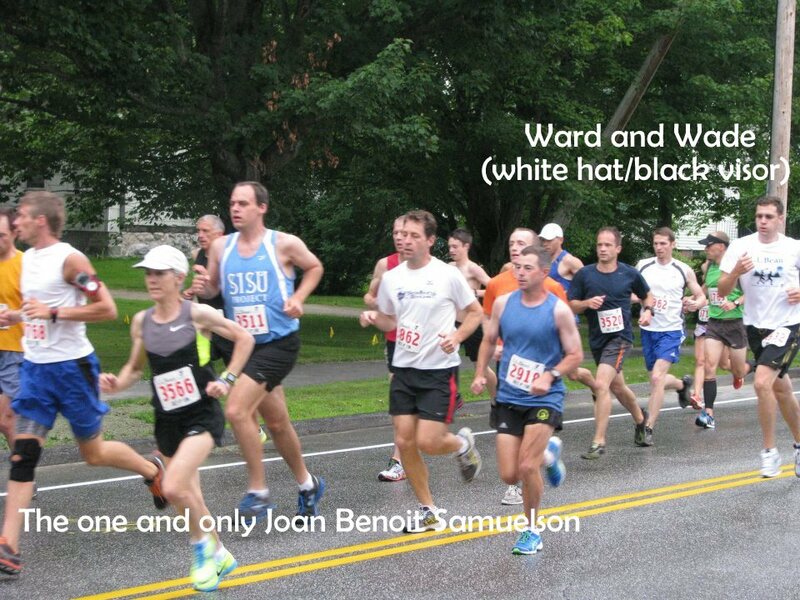 My problem is that there are 1500 people crowded on the streets of Freeport and maneuvering through the crowd to get to my comfortable pace is a huge challenge. There’s a lot of dodging people and hoping no one plows me over for the first 1 – 1.5 miles. At the 3 mile mark, I was cruising. My time was 23:00. If only there weren't those crazy hills for the last half, I would have crushed my 10K time! This tells me for sure I need to focus on hill training. Finish time – 49:18! 1 MINUTE, 11 SECOND COURSE PR! I think I owe this excellent race to having an incredible cheering squad at this race - my aunt and uncle are up from Pennsylvania and came down with my dad to watch the race (and take pictures) Love you guys! My 10K pr is 49:11 at Beach to Beacon last August. I wasn’t too far off the mark. Such a HUGE improvement over my 1st LL Bean 10k when I sucked on an inhaler and walked EVERY SINGLE HILL. Heck, I have no idea where my inhaler is. Now that just feels freakin’ awesome! Next 10K goal – break into the 48’s. I know I have it in me. I just have to find the right course for it. And no, I’m not doing Beach to Beacon this year. I didn't even try to get into the race this year. This year I’m heading down to the race to cheer on everyone we know running the race and to watch the elite runners cross the finish line. I’m going to love being a spectator for that race. Back to LL Bean for a quick moment - Ward did quite well in his race as well. He placed 1st in the LL Bean employee division (because the race is an LL Bean race, of course there is an employee division). His prize was a day hiking backpack. Way to go, hubby! Sounds like a fantastic race. Congrats on you PR. Woohoo!! way to go! that's awesome! and you look so cute! Yes - of course! Just let me know when you'll be up for another race! Great job and recap! Next year....maybe....hahaha! Oh, and I'm "borrowing" that picture of the four of us where I look like I'm about to pass out, unless you mind. Great job! I wish I had known about this race! It would have been fun to do it too. I see Carrie got a Running Skirts tank too!! They rock! Great job on the running skirts and congrats on your course PR! That is a cute race tank - perfect for hot summer weather! I tried out the tank yesterday and it's perfect. LOVE it. We've gotten tanks the last 3 yrs - and I think this one is the best one so far. Oh awesome time! I've never run a 10K. I really need to sign up for one this year just to give that distance a shot. Woohoo, great job! Sounds and looks like a great race! Congratulations, you did amazing for such a challenging race! I'll definitely have to keep this one in mind for the future, but we really want to try to get into Beach to Beacon someday! Congrats on the new pr, hill and all!! That's awesome. And I love those blue sparkle skirts... I'm inspired to dig out my sewing machine again. Those turned out so cute! They weren't so hard - but I found it rode up quite a bit when I was running. I think I need to adjust it a bit. Trial and error. Great job! With my 5k a few days ago it has me thinking about a 10k... congrats on the PR. Fantastic. And you all look fabulous! Congrats on your course PR! Now I'm sad that I didn't make the trip to ME on the 4th to run this. I love the shirt and the chance to win free New Balance shoes is exciting! Hooray for Ward being one of the lucky winners!